Common Names: Alicante Bouschet (Portugal) Garnacha Tintorera (Spain) – Dark juiced hybrid grape that can produce deep dark wines, with spice, rich fruit and a gentle earthiness. Trivia fact number one: Most red grapes have white juice! This is best illustrated by the fact that most wines from Champagne are white, yet almost all contain small or large amounts of Pinot Noir – a red grape. 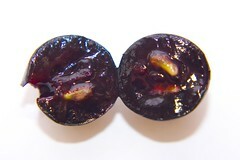 In fact, there are only a few wine grapes which contain red juice. Alicante Bouschet is one of them. To be honest, I have had a very limited experience with Alicante Bouschet. In my old wine shop in Minnesota, we used to make jokes about bad wines being made from this grape. “Oh, I bet it’s just a bunch of Alicante Bouschet”, we would say while laughing hysterically. Our ignorance wasn’t completely off base when we dismissed this grape as unexciting grape juice. Originally, a cross-breed developed in France of Petite Bouschet (a cross itself) and Grenache, it had been a workhorse in wine making industry for a significant portion of its history. With possible yields as large as 12,000 tons per acre, it produced juice for industrial wine making operations for centuries. 1) Don’t accidentally let your grapes sit in a large container where they will be crushed by their own weight. 2) If the grapes begin to bubble in the container, stop it immediately or else it shall produce alcohol. Etc. etc. etc. When I asked winemakers how a varietal known to make outstanding wines in the Alentejo is being slammed as a second rate grape elsewhere, they told me it all comes down to how you handle it. It does produce high yields; therefore, you need to do extensive green pruning (removing green bunches of grapes to reduce yields) in the summer. Then, in the fermentation stage, the winemakers need to remain sensitive to the point at which the wine could become oxidized and loses its rich phenolics. Upon telling one winemaker that he couldn’t expect me to believe that you could create a long lasting Alicante Bouschet of high quality, he proceeded to give me a barrel sample that had been in oak for 16 months. WOW rich, complex with light spice, rich red and black fruits, and a finish that felt eternal. This was not what I expected. I quickly made a mental note to try Alicante at every bodega I visited, consistently tasting wines that defied my previously held beliefs on this rouge grape. One of the winemakers had tried a 40 year old bottling of a high-end 100% Alicante Bouschet from a Bodega in Mouchão that still contained incredible body and vivacity. Deep dark and purple to core, in fact light barely gets through this one. The nose is a mix of vanilla, pepper, wet slate, and nuts, all smeared across a palate of dark fruits. In the mouth it causes me to drool with it’s lush texture and fine tannins. The oak makes itself known in the background as myriad flavors come through in the mouth with cherry, blackberries, dark chocolate, pepper, cut grass and pure grape notes being only a few.